This photo was taken in North Carolina Sept 2012. A group of fellow scrappers were visiting Maggi Harding. Her wonderful husband kindly offered to driving us around the rural parts of North Carolina to find interesting sights to photograph. This chair was inside an equally dilapidated house. As we peered through a window frame, we saw it and dubbed it the "timeout" chair. 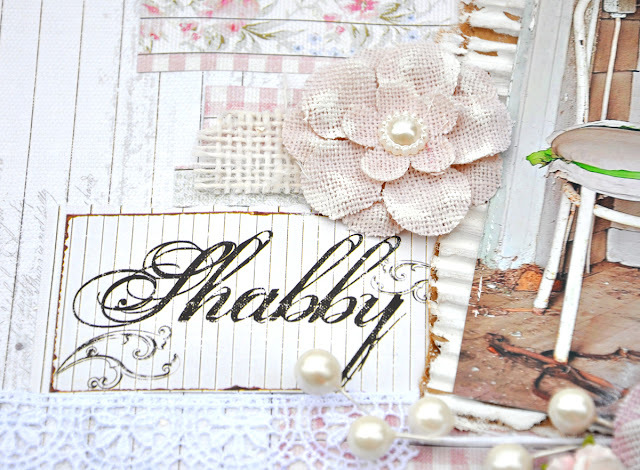 The layout was made using the most fabulous collection from FabScraps - Shabbylicious. This is a shabby chic gals dream collection. Light pinks and blues and a touch of whitewash. Amazing chipboard pieces and die-cuts that are absolutely innovative. They mix and match with the chipboard pieces. In the photo above, I used the FabScraps chipboard piece called "Formal Chairs" and covered it with a die-cut to match. What a cool and clever idea. You can find the whole collection here. You can purchase the collection at Flying Unicorns. 2. 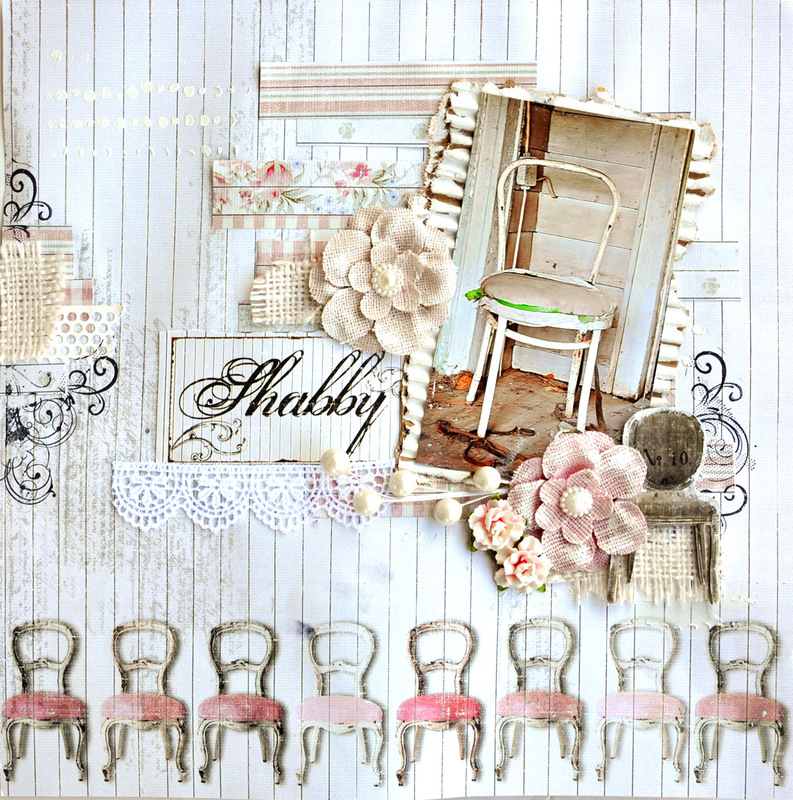 Start with FabScraps Shabbylicious Collection –Chic Chairs paper C60 006 for your background. 3. Cut strips of Shabbylicious Collection –Chic Mix C60 008 and layer the strips horizontally on the right side of the page starting an inch from the top. Continue the layers down the page to about an inch from the chair graphics. 4. Add a few small paper strips to the left edge of the paper halfway down the page. 5. Add decorative tape over the paper strips on the left edge of the page as a new layer. 6. Add some texture to the page using the stencil and molding paste or heavy gesso around the page. 8. Rip a piece of cardboard just a little bigger than your photo and paint the cardboard white with gesso or acrylic paint. Let dry. 9. Adhere the photo to the dried cardboard. 10. Glue the card board to the page on a slight diagonal on top of the layered strips of Shabbylicious Chic Mix paper. 11. Glue the “Shabby” journal piece from the Shabbylicious Collection - Journal Packet MC60001A to the bottom left of the photo..
13. FabScraps Shabbylicious – Formal Chairs chipboard DC60 011 has an accompanying die cut found in the Shabbylicious journal packet. Cut the chair out and glue to the chipboard piece. 14. Lightly paint the edges of the chipboard chair with gesso. 16. Glue lace trim under the “Shabby” journal card. 17. Stamp some flourishes to the bottom right of the photo. 18. Stamp some flourishes to the left edge of the paper halfway down the page (near the paper layers). 19. 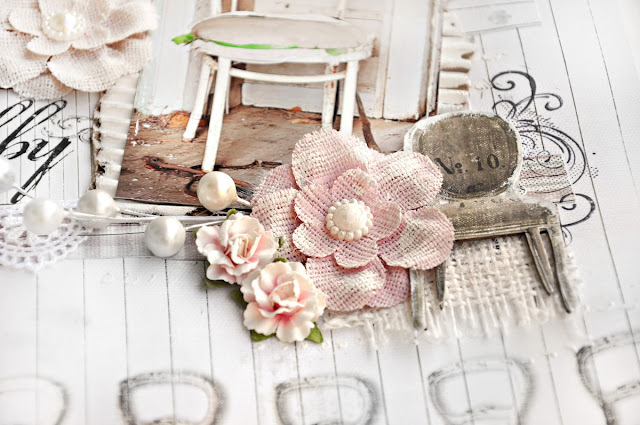 Glue some small pieces of burlap around the page –under the cardboard photo mat – a little piece to the left of the photo – to the left edge of the page as a new layer over the paper strips and decorative tape. 20. Glue chair chipboard in place to the right of the photo and on top of the burlap. 21. Embellish with flowers and floral berries as desired.